Over the years I’ve really enjoyed Val Kilmer and his movies. I find him to be very funny in person, as you can see from any interview he’s ever done or if you’ve ever seen any of his blooper reels…but his acting is top notch too. He’s gotten a bit of a bad rap over the years, but I can appreciate that he acknowledges that he could have been easier to work with at times over the years. He’s mellowed a lot with age and by all accounts a real joy to be around for the most part, engaging, funny and authentic. Great cast, interesting western. Kilmer once said that he would play in a bad western on a great horse any day and this mini-series can live up to that assessment. It’s a Larry McMurtry story, with his characters from the Lonesome Dove series and stars the ever likable Steve Zahn as well as Karl Urban, Elizabeth Banks, Wes Studi, Adam Beach, Linda Cardellini, and Rachel Griffiths. Some of the scenes were filmed on Val Kilmer’s ranch in New Mexico. Val Kilmer’s work with the New Mexico Film Investment Program over the years fueled a nearly 40-fold growth in the state’s annual film production revenue, from $3 million in 2002, up to $117 million in 2006. 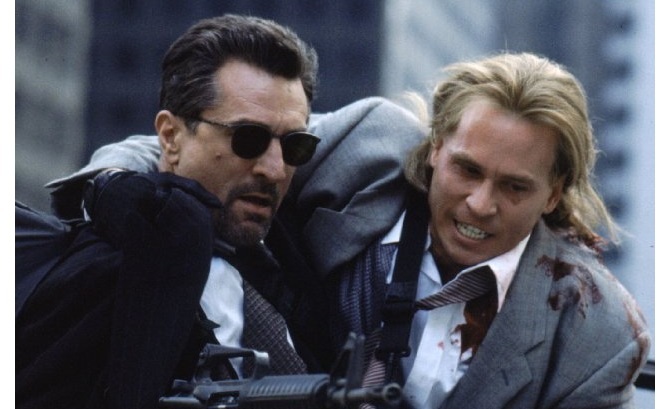 In this film, there is a huge shootout in the middle of the city between Robert De Niro, Val Kilmer and their crew and Al Pacino and the cops. They had to do a lot of training to be able to shoot the guns realistically. Kilmer was thrilled to learn that the moment in the gun battle scene where he runs out of bullets and rapidly changes his magazine is regularly shown to Marine recruits as an example of how to perform the action properly. Also, in order to prepare the actors for the roles of McCauley’s crew, Michael Mann took Val Kilmer, Tom Sizemore, and Robert De Niro to Folsom State Prison to interview actual career criminals. It helped that Danny Trejo, who plays a member of the crew, had in real life been an inmate at Folsom Prison. It’s interesting to note, before Danny Trejo was cast, both Edward Bunker, a writer, and Trejo were hired to be armed robbery consultants, since they both did time for these crimes and knew the ins and outs of performing such crimes. After meeting Trejo and talking with him at length, Michael Mann would later offer him a role in the film. This little gem, directed by Renny Harlin, was caught in a studio’s bankruptcy and held for release up to two years later, even then it was silently released straight to video…but it’s actually a really fun film. Has some really good moments and has Jonny Lee Miller, LL Cool J, Christian Slater, Patricia Velasquez, Clifton Collins Jr, and Eion Bailey in it. It reminds me of an FBI training version of Agatha Christie’s And Then There Were None, which I love a lot. This one would be on the top of the list of films that were made with her plot device of people dying one by one in a remote place, trying to figure out which one of them is the killer. You can see my blog post on that by clicking here. This one has Val Kilmer playing a blind man that regains his sight. His sister is played by Kelly McGillis, his co-star from Top Gun. The cast is excellent with Nathan Lane, Steven Weber, Mira Sorvino, Bruce Davison and Ken Howard. Val Kilmer prepared for his role by studying with a sculptor friend of his in New Mexico who had lost his sight in Vietnam. At 49:30 (NTSC) he is admiring a sculpture when he first visit’s Amy’s flat. Now, if you want to see how good an actor Kilmer is then watch this movie as he’s very good in it. There are a few times when I think he really should have gone up for an Oscar nomination at the very least and this is one of those performances. Other performances where he deserved recognition would be as Doc Holliday in Tombstone and as Jim Morrison in The Doors. Kilmer’s first movie and it’s flat out hilarious! My brother and I love this movie. He’s so funny in this. It’s done by Jim Abrahams and David Zucker right after they did Airplane and Police Squad…so they were really on a roll. You can thank his casting in this film to Kilmer’s first Broadway acting role in 1983 in a play called Slab Boys which also starred Kevin Bacon, Brian Benben, Sean Penn, and Jackie Earle Haley. Kilmer would sing all of the Nick Rivers songs in the film himself, which would help him later when he decided to do The Doors. This is based on a true story and is quite a good thriller. It’s about 2 lions that start to hunt and attack construction workers on a railroad track in Africa. The title of the movie is the nicknames for the 2 lions. Michael Douglas’s character Remington is fictionalized for the movie. In real life, Val Kilmer’s character John Patterson killed both lions (both nearly nine feet long). The real Lt. Col. John Henry Patterson published a book about his experiences, titled “The Man-Eaters of Tsavo“, which the movie is based on. The book is still available after nearly 100 years, and well worth reading. 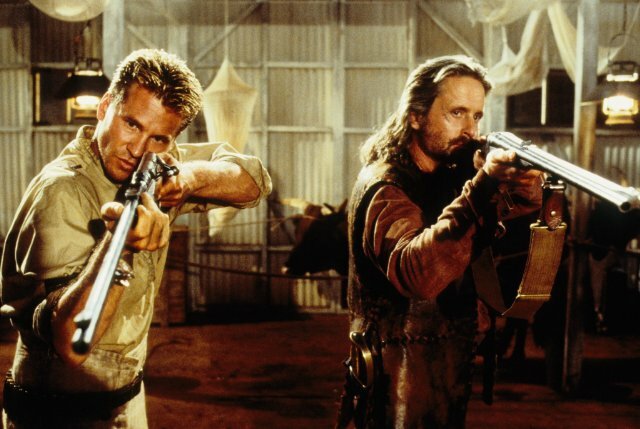 Originally, the movie was only to be produced by Michael Douglas, with Kilmer as the lead character, but somewhere in pre-production he insisted on having the Remington character created for him and as filming progressed his part was widened to what is in the film now. He eventually got top billing. Despite having top billing, Douglas still doesn’t appear on screen until 45 minutes into the movie. This is a really good sci-fi thriller that again seemed to be released straight to video, but is definitely worth finding, if you haven’t seen it. It has another fun cast with Tom Sizemore, Carrie-Anne Moss, Benjamin Bratt, Terence Stamp and Simon Baker. It didn’t help the release of the film that another Mars movie was in production at the time and often gets confused with it; Mission To Mars. It also didn’t help that the movie’s release date was pushed back twice. The original release date was slated March 31, then it was pushed back to June 16, and again it was pushed back to November 10. Studio officials said it was due to the movie’s extensive, expensive special-effects work. Now, here’s a movie that my brother and I just love, but if you were to take Val Kilmer out of the movie, then we wouldn’t even like it probably, he’s that good in it. He really stands out and it’s this movie that convinced us that he was going to be a big star. I think the studio knew it too, that why the title seems to refer to him and all the posters feature him by himself, when he isn’t even the main character. The marketing strictly pushed him as the whole film. The singing that Kilmer does in the film is so close to the real Jim Morrison that even the real band members of the Doors couldn’t tell a version of a song sung by Morrison than that of Kilmer. In one scene during the filming of the movie, Kilmer broke his arm badly when he performed a jump from the stage into the crowd. The stuntman failed to catch him, leaving Kilmer with an abnormal growth on his right elbow. The growth is clearly visible in Heat, when McCauley discovers Shiherlis sleeping in his living room and begins briefing him on their itinerary. 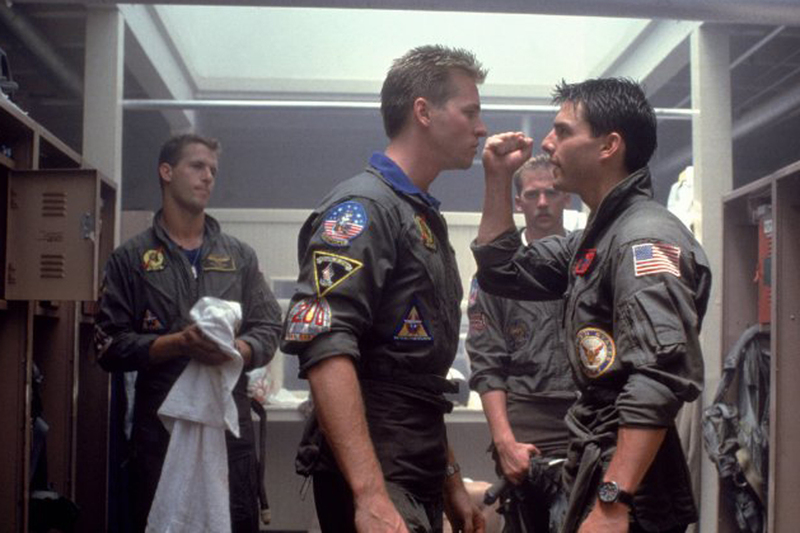 Val Kilmer and Meg Ryan were also in Top Gun together. Incidentally Kilmer worked with director Oliver Stone on this film and Tom Cruise worked with Stone on Born on the Fourth of July. I just like this movie, even though a lot of people who loved the Saint TV show was disappointed with it. 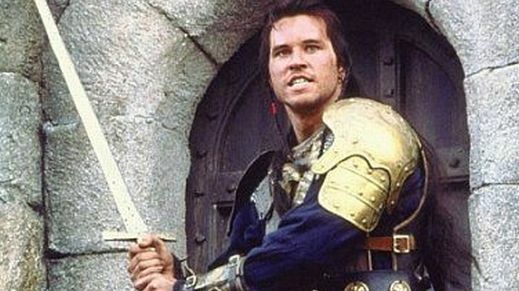 Val Kilmer got to use several disguises in the film, which I thought were a lot of fun. Plus it had, Elizabeth Shue…what’s not to like? 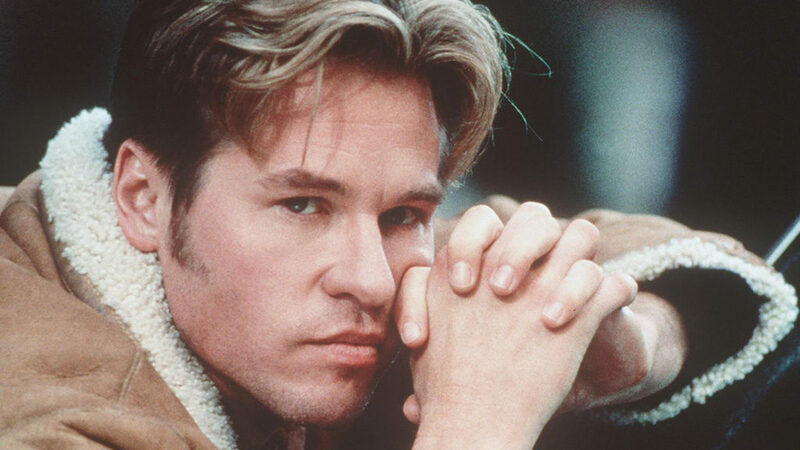 Fun Fact – the poetry written by Simon Templar’s disguised-long-haired artist character, Thomas Moore, was actually written by Val Kilmer himself. Kilmer decided to do this movie instead of Batman and Robin. It was the first big-screen Saint film since the 1950s. Plans for a Saint film date back to the 1980s, when Pierce Brosnan was reported to be a leading contender for the Templar role in a Saint movie that was to be produced by Roger Moore, the original TV Saint. This project never materialized. The Saint (Simon Templar) over the years has been played by Vincent Price (over the radio), Roger Moore on TV, Louis Hayward, George Sanders, Hugh Sinclair, Felix Marten, Jean Marais, Simon Dutton, and Ian Ogilvy at the movies. 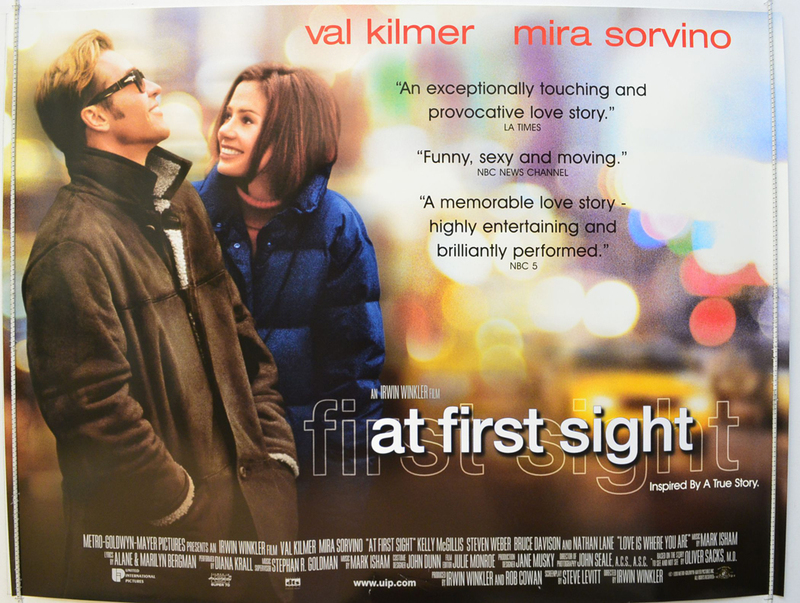 Anyone who wants to see how truly funny and spontaneous Val Kilmer can be should watch the blooper real to this movie. Robert Downey Jr., who is incredibly witty in his own right has a hard time keeping up to the laughs Kilmer produces. Val Kilmer met Robert Downey Jr. for the first time at a Hollywood party. A week later he received the screenplay for Kiss Kiss Bang Bang and agreed to do it before he’d even finished reading it. Upon agreeing, and much to his delight, he was informed that Downey Jr had already been cast. 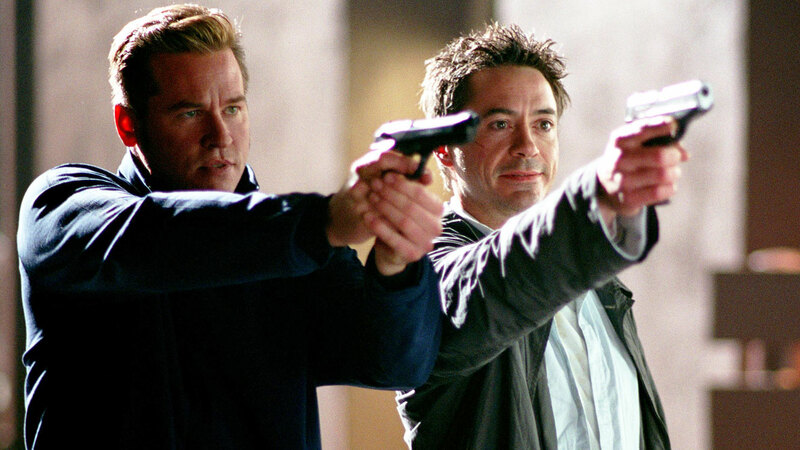 As a sign of support to Robert Downey Jr.’s recovery from alcohol and drugs, Val Kilmer refused to drink during the entire production. I’m a big Raymond Chandler fan and I learned that Shane Black read several stories by Raymond Chandler when writing this script. As a result, the story is divided into chapters and the chapter titles come from Chandler works. Specifically: 1. “Trouble is My Business”, 2. “The Lady in the Lake”, 3. “The Little Sister”, 4. “The Simple Art of Murder”, and Epilogue: “Farewell, My Lovely”. The title makes reference to James Bond, Thunderball where a song was produced and recorded for the film called, “Mr. Kiss Kiss Bang Bang” and “Kiss Kiss Bang Bang” has since become a slang description of the James Bond-style spy genre. The film’s original title was “You’ll Never Die in This Town Again”. When Harmony is seen on the bus leaving Indiana at age 16, she’s asleep with the Johnny Gossamer book, “You’ll Never Die in This Town Again” in her lap. Here’s pretty much his only fantasy movie, but it’s a great one. He plays a swordsman Madmartigan, a rogue and a really fun character. He had a real fun time working on this film with George Lucas, Ron Howard and Warwick Davis and met his future wife Joanne Whalley on. His comedy really came into play again on this one, and it’s documented that a lot of his dialogue is improvised. 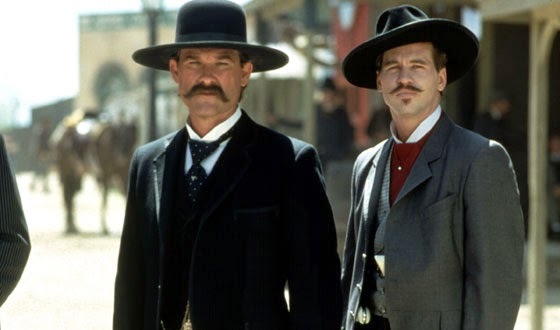 Val Kilmer practiced for a long time on his quick-draw speed, and gave his character a Southern Aristocrat accent. The expression “I’m your huckleberry” spoken by Doc means “I’m the perfect man for the job.” It could indeed be a reference to Mark Twain’s Huckleberry Finn, then known as the sidekick of Tom Sawyer before Huck got his own book. The phrase also refers, rather ominously, to the pallbearers who carry a coffin or casket to the actual grave site & specifically the one elected to sit, completely sober, in case the grave bell rings. So saying, “I’m your huckleberry ” could also be a threat like “I’ll put you in your grave.” It’s interesting to me that this would be attributed to Mark Twain as later on Twain would be an inspiration to Kilmer and he would go on to write and star in 2 plays about the writer, and star as Twain himself.